Blog | March 2018 | 3 Paper-Only Craft Ideas Anyone Can Make! 3 Paper-Only Craft Ideas Anyone Can Make! Whether it’s cut, folded, rolled, or adhered, paper is such a versatile material. Today, we’re showing you that with some sheets of decorative paper, adhesives, a few simple pieces of equipment, and a touch of imagination, you can create some really eye-catching makes! Papercrafts are so easy to make – and fun too! Today, Maxine has got three ideas that are guaranteed to inspire. Use your favourite paper to make these fun rolled paper candles. We used the Let’s Celebrate pad from First Edition with textured cardstock to create flames. We love the dimension to this card, and it’s the perfect way to use up your paper scraps! 1. Cut three pieces of complementing papers from your Tropicana paper pad measuring 6cm x 5cm. Roll each piece around a pencil or pokey tool and secure the roll together. 2. Cut three flame shapes out of the yellow card stock. 3. Add double-sided tape to the back of all three rolls of paper and adhere them to the card blank. 4. Adhere the flames to the card with foam pads to add dimension. 5. Add your sentiment to finish. You now have your finished candle card ready to send! Use the coordinating V&A papers to create this minimalistic greetings card. Although this card is simple to make, it still looks really impressive and it’s perfect for when you need a quick and easy design! This is also a great way to use any paper scraps that you might have laying around. Give your family, friends and new neighbours a warm welcome to their new place with this stylish house-shaped card. 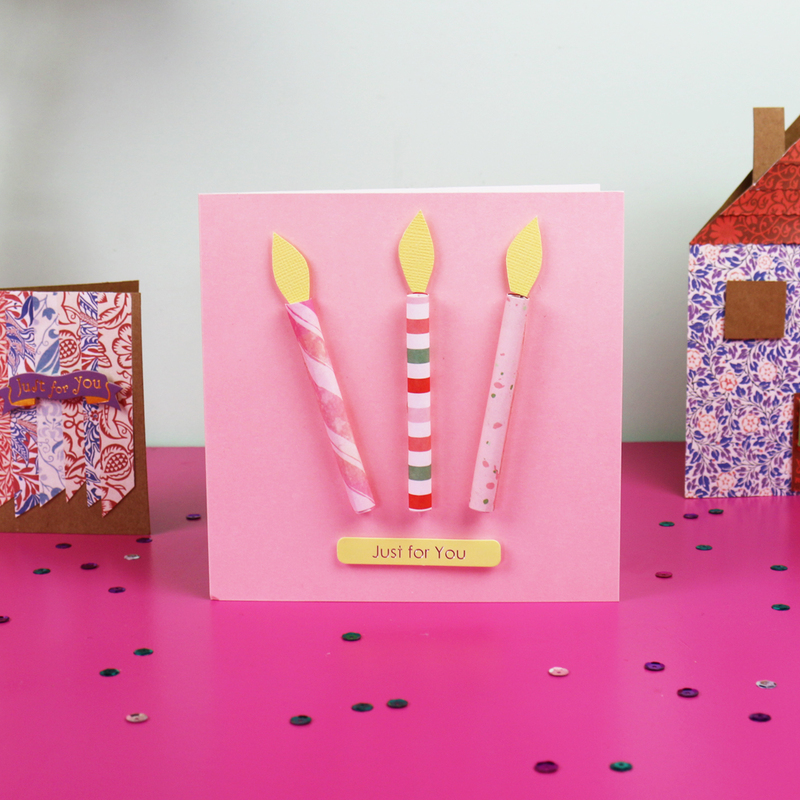 Again, we used the stunning papers from the V&A Papercraft Collection along with kraft card to create a cute home-shaped design and finished it with a V&A sentiment topper. We used the We R Memory Keepers Dial Trimmer wave blade to achieve the finish on the roof to add texture and foam pads to add a touch of dimension. Will you be trying our paper only crafts? Which will you be trying first? We’d love to see, so don’t forget to share your projects in the Inspiration area and to #Trimcraft when uploading to social media!